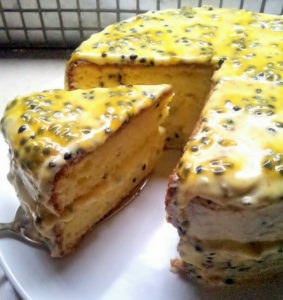 We are absolutely loving Granadilla Cake here at St. Marcus! Last year saw us do a lovely, granadilla fridge tart, but we didn’t stop there. The tart had to have a cake buddy and so, we went in search and found this gem! Light, fluffy and totally scrumptious, we present you with THE granadilla cake! Start by preheating your oven to 180°C, then grease two sheets of baking paper and line your 2 x 21cm cake tins. Set aside. Now grab a large bowl and sift your flour, baking powder, salt and 1/2 cup caster sugar in. In a separate bowl, whisk together your egg yolks, oil, milk and the granadilla pulp. Now add this mixture to the dry ingredients and stir well. You need another bowl here, to whisk your egg whites into a stiff mixture. Once you’ve reached that stage, add the remaining caster sugar in batches while whisking, until it’s all added and you have a thick and glossy result. Add a big dollop of this mixture to your cake batter mixture to loosen things up and then fold the rest in with a metal spoon. Divide your mixture between the two cake tins and bake for 25 – 30 minutes. TIP: The cake should be pulling away from the sides of the cake tin and the skewer should come out clean. Immediately turn out onto a cake rack once cooked through. Remove the cake tin and baking paper and allow to cool completely. Take some of the cooling time to make your icing, by combining your butter and granadilla pulp. Next, you want to work the icing sugar into the mixture in batches. Be sure to add lemon juice so it’s a spreadable icing. Sandwich your two cakes together with half the icing and use the rest for the top. Drizzle granadilla pulp over the top and enjoy!